The entry is written from the fictional perspective of those responsible for the creation of my life-form, as I felt this would be more interesting to read than a dry fact-file. However, I have taken care not to allow things to blend too far into the realm of a narrative. I hope I have been successful in this attempt. 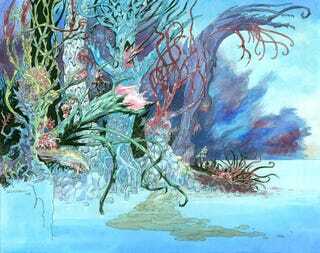 As a prize, Gresswell will get $1000 US, and the original copy of the illustration of the Blue Forest that renowned comic book artist Kevin O'Neill drew (above). O'Neill, who illustrated Alan Moore's League of Extraordinary Gentlemen books, as well as Nemesis the Warlock, said the Blue Forest was "quite fun" to draw, and he seemed especially impressed with the fact that the the forest left a kind of brown sludge in the water behind it — effluvia from the forest's rampant fish-eating. O'Neill also decided to add people in hazmat suits exploring the Blue Forest. We have been trying to get in touch with Gresswell to give him his prize, but he seems not to be answering email. Hopefully he hasn't been experimenting with nano-fed forests and been turned into tree fodder. So Elliott, if you're reading this, do get in touch. Without further ado, here is the winning entry: Blue Forest The following files are taken from the remains of the United Acolyte Private Scientific Research Project, based in a secure location near Southern California. Prior to their shut down following a series of money laundering scandals, the Acolyte Project made a number of important scientific breakthroughs. The most controversial of this lies in the creation of an entirely new form of life- the semi-sapient “Blue Forests” that are now a fairly common sight off our shores. The following are taken from the Open Diary of Doctor Elizabeth Haid, interspersed with several situation reports from the recent Forestry Group expedition to East Africa. It should be noted that this latest exploratory mission takes place some twelve years after the initial Blue Forest design team concluded their research. Life-Form Design Program, UAP SRP [Oct 29th]: Elizabeth Haid, Public Diary. Bearing the limitations of this facility firmly in mind- particularly the financial ones- it would appear that attempting to create any kind of sophisticated higher level super-bio-form is an currently impossibility for us. Sorry, guys and gals. That Holy Grail’s for another day. With any luck, the L.A. branch is having more luck. Bunch of self-inflated bastards. With this in mind, I recommend sticking to the simpler levels of life; although, note to Randell’s Division, constantly sending us slightly more menacing versions of a Paramecia Amoeba does not constitute acceptable progress. We want something at least vaguely usable. Any ideas? [Diary, Nov 3rd] Note to Dante down at the Vegetation and Environ Section- we’re really not interested in anything that even resembles a Triffid. No, we don’t care how tasty and delicious they are when boiled. No plants that prey on humans. [D-Nov 16th] Pursuing the nanotech-life idea was definitely a bad idea. Lab Seven has been reduced to a Grey Goo state, totally liquefied by the technology- which, fortunately, self-destructed. Somebody get a mop and bucket down there immediately. On the plus side, the walls and doors are still intact, so at the very least we now have a large self-secure Containment Chamber. You would think we’d have installed one of those before we lost twelve technicians in a largely avoidable accident. Data Report: Aerial Observation Team Blue Forest #012 Lake Victoria. First Day of Watch. We found one early this morning. Thank God - I can’t take many more days of fruitless searching. Even when I sleep, I can feel the helicopter blades rattling in my head- whoomph, whoomph, woomph- it’s getting unbearable. But now it’s all worth it, because we saw one. It looks... what can I say? It looks like a cross between an island and a sponge, all covered in plants. And I suppose that’s exactly what it is. Of course, from here you can’t see that it goes all the way down to the bottom- just the ripples from the surface. It’s strange, I want to picture it with a face. I want to make the foliage form eyes and a nose. I mean, I know it’s alive. I’m used to living things having a face. The weird thing is, if I peer close enough, I can almost pretend that it does. We’ll come back tomorrow, watch it some more. It’s not going anywhere- they don’t exactly move fast. Strangest thing a sober person ever saw. [D-December 3rd] We’re actually beginning to think Randell’s ideas may have promise. His nutrient bond tethers each Amoeba together at the mitosis stage, forcing them to function as a single joined entity. Subsequent cellular splits come with similar connections- as if each single cell is tied to its sibling by a microscopic umbilical cord. Unfortunately, the resulting life-form is usually a sort of transparent, vaguely vicious liquid that subsists entirely off of sugary water. We’re probably going to need something a little more versatile. Recommend seeding the remains of Lab Seven over to these experiments. Seems somehow appropriate. [D-December 15th] By exposing the bonded-cell polyform (the rather useless entity we’ve nicknamed Soup) to up to three times standard Earth gravity, we’ve encountered a number of surprising effects. Firstly, the Soup cells have become markedly denser in order to cope with their conditions, developing into a sort of Protoplasmic mush. Secondly, though the cells themselves have naturally decreased in size, they’ve made up for this by increasing their rate of reproduction. This might be something to do with the alternate food source we’ve been experimenting with. It appears that the life-form prefers something a bit meatier than a simple saline solution; we’ve been feeding it a sort of mould paste. This seems a little incestuous, since the life-form is effectively a very dense, highly organised cousin of mould. If we can continue tweaking the density like this, we might be able to successfully elevate the life-form from Soup to something more akin to Oatmeal. Data Report: Aerial Observation Team Blue Forest #012 Lake Victoria. We got hear just in time to make out the Forest, wading down the lake. It creeps me out, to see them shuffling like this... I’m reminded of all those childhood B-Movies I never finished. There’s something about that writhing surface, even if it’s really just waving in the wind for the most part. And another thing - who dialled up the luminosity on the thing? Bright blues and greens, really? It must look mighty stupid to the rest of the kingdom. Still, I have to say, it’s exciting to observe this creature- it is just one creature, isn’t it? Yes, good. It’s like... like... well, it isn’t like anything. That’s the point. I almost wish we could land on it, have a look around. No. No I don’t. We were ordered to stay in the air, and that’s what we’re do. I’m glad. I don’t want to land. Not at all. No. [D-December 20th] No, Dante, we don’t care if you’ve removed the stingers, increased the fibre content and found a way to keep them from moving- nobody wants Triffids, Triff-oids, pseudo-Tiffida or any variation thereof. Just, stick to GM spider plants, would you? [D-December 21st] Increasing Lab Seven’s internal gravity by another three levels had unfortunate results. Everything dies. Next time, I think we’ll increase the g-levels one at a time instead of three. [D-December 23rd] Whilst developing another crop of Soup, we’ve been modelling it on E-Coli for the purpose of convenience. It should now be much more inclined toward versatility. [D-Jan 14th] Success! We have Oatmeal! [D-Jan 17th] Dante finally has something useful to report- by splicing Corn and Spider Plant genomes, his department has created a hybrid which reproduces with all the gusto and unnerving ease of a Spider Plant whilst maintaining considerable nutritional value in its leaves. Now, if we could just get it to grow fruit... Unfortunately, the thing requires Uber-dense soil. Hmmm. [D-Jan 22nd] Things have progressed beyond Oatmeal; the life-form has now reached what our researchers have dubbed the ‘Steve McQueen,’ phase- that is, it has become a sort of ultra-dense self replicating gelatinous mass virtually identical to the Blob from Mr. McQueen’s B-movie classic of the same name. Except our one is blue. [D-Jan 28th] The McQueen Organism is growing rapidly; so much so that we’ve had to seal off the room. Good job we picked Lab Seven. It does seem to require a regular ambient food source- unlike Grey Goo, it can’t just consume everything. Also, its environment needs to be kept at a stable 2.3 gees to prevent it collapsing back into Soup form. This means we should be able to keep it contained; which is handy because in its current state, the thing is more or less indestructible by conventional means. Now, if only we had a clue what the hell to do with it. [D-Feb 1] Breakthrough, and it’s all thanks to Dante. Maybe we won’t fire him after all. The GM crops require an incredibly dense, fertile food source; far more so than we’ve been able to provide without the presence of an active Volcano. However, the Triffid (I’m sorry, that sounds absolutely ridiculous, can we please just use the real plants he used? I don’t care how modified their basic biology was). However, the Venus Fly Trap-based constitution of the GM crops demands that they subsist on living creatures. We think there might be an equitable solution to all our problems, but certain tests still need to be run. [D-Feb 13th] Turns out, we were right. The McQueen life-form [currently called Blue Goo by the staff, who don’t seem to be able to stick with a damn moniker for fifteen seconds] lives just as well under water as it does on the surface. Mostly it’s able to survive the way any water-born bacteria would, only on a much greater scale; if it develops to require additional food sources, we’re sure the ocean has plenty of plankton. And also whales. What? A biologist can dream. [D-Feb 15th] First steps to introduce the GM crops to the Blue Goo were only mildly successful; both organisms threatened to consume each other. More refinements needed. [D-Feb 16th] Success! All we really had to do was ‘plug’ the GM crops into the Blue Goo, and wait. The Goo acts as part soil, part food source, allowing the modified Spider Plants all the nutrition they need. Of course, the plants must consume the Goo, but its vast rate of growth makes this a relative non-factor. Furthermore, the plants as they are remain indigestible to the Goo. This is very exciting. [D-March 8th] Tests continue to go well; the plant roots easily intertwine themselves in the viscous, semi-permeable Goo, spreading through the thing like a thousand grasping claws. It appears that the Goo can probably sustain vast crops indefinitely. We’re going to stick some Water-Lilly in the gene pool with the next foliage splice, however- we want to make sure the things can survive underwater. [D-March 12th] Salt water’s out of the question- too many complications. It’ll have to be fresh. Data Report: Aerial Observation Team Blue Forest #012 Lake Victoria. Third Day of Watch. Now we see. It was positioning itself near the biggest waterfall it could find, just at the base- so close that the Crop leaves must be getting damp. It sits at the bottom, as if collecting dew. No. That’s not what it’s doing. It’s collecting fish. We think it might be feeding. [D-April 1st] Experiments confirm- it is perfectly possible to place the Blue Goo underwater; it sinks to the bottom, where it can find a comfortable pressure, then proceeds to grow upward- toward the light. By the time it reaches the top, it appears to have adapted sufficiently to maintain its consistency within the low-pressure of the surface environment- creating a veritable column of almost luminous, sapphire sponge, only slightly thicker than the river/lake itself. From the bed to the surf. The Crop can therefore be perched at the top of this infinitely expanding column, taking sustenance and growing out. By that point, the two should have formed an unbreakable symbiosis- removing the Crop from the Goo would be impossible. The roots go too deep. The Goo will expand, and the Crop will grow. Obviously, they’ll have to be contained in fresh-water reservoirs. Just in case. [D-April 3rd] We’re going to need a name for the joint organism, obviously. Potential designations thus far mooted; Spider Goo, Plant Goo, Spider Slime, Water Babies, Water Forest, Slime Forest, Wild Goo, Gilligan’s Island (who the hell thought of that one? I’m looking at you, Syd), Omnious, Expanding Front, Mayfly Island and, of course, The Blob. [D-April 4th] The first specimen was released into a Lake Reserve Yesterday, finding a new home for itself in Florida- exact location classified, thank you very much. It’s reportedly doing very well; the heat agrees with the Crop, and the Goo is already spreading to fill the bay. [D-April 8th] Um. Those Venus Fly Trap Genes... we did make sure that it wasn’t going to start developing mouths or anything, right? Technically impossible, you say? Good, good. [D-April 9th] Traps. The thing is developing its own very special Venus Fly Trap Variants. Also, though most of the spider-like leaves remain just that (leaves), a few of them have reportedly begun to show signs of independent movement. That had better be some particularly weird wind-tunnel effect going on and not, for instance, tentacles. It’s bad enough that people are beginning to think the thing eats birds. [D-April 13th] Well, if it wasn’t already taken, I’d think Sea-Cow would qualify as a good name; the thing is, after all, one big lump of tasty and delicious. The Crop is extremely fertile- it’s also beginning to bear fruit, deep within the increasingly dense Spider Plant thickets [each individual plant is, by the way, now roughly the size of a tree]. No, don’t ask me how it managed to do that. It seems likely that various non-indigenous weeds are cross-pollinating with the Crop, which was of course always a potential factor. Whatever these alien plants once were, they’ve now been integrated into the Goo, and they’re not going anywhere. Data Report: Aerial Observation Team Blue Forest #012 Lake Victoria. Fourth Day of Watch. The Forest has been moving, very slowly, down the river. Still, when I say slow, we can nevertheless see it- it even leaves a little phosphorous trail. Maybe the thing’s faster than we think. I mean, bacteria is pretty fast, isn’t it? [D-April 20th] Some of the plants have been tinged with light blue highlights, presumably because of the Goo. That’s given rise to a new name for the thing, one we all quite like. Blue Forest. Preparations for other Forests around the world are underway. Sure, harvesters have to wear protective suits and carry machetes, and sure, there’s a certain amount of evidence of... tentacle based... activity, but the fact is that Blue Forest is one hell of a Golden Goose. With Golden Eggs, Golden Feathers and, I’m beginning to think, Golden Blood to boot. [D-April 25th] The Blue Forest moves. Very, very slowly - as it expands in one direction, it dies off in the other, grazing onward, ambling along a seamlessly aimless course. We think we know why. Plants grow toward the sun, obviously- well, the Crop moves to face it, too. And the Goo... it moves with the currents, presumably in aide of its own comfort. Perhaps it’s looking for simpler pressure equilibriums. Or perhaps it’s looking for others of its kind. No. That would just be weird. The Forests also sing. The noise is probably made by sound waves oscillating through the dense jungle- wind whistling through the leaves, if you will. An odd rattling that, I’m told, is actually strangely beautiful. I find it difficult to picture. Apparently its soothing- wave after wave of fan-like rustle. Hmm. I must visit one someday. These Forests- I was joking earlier when I said they’d graze on whales, but now, I think it might be possible. Good job they’re strictly fresh water only. These things, these weird meldings of plant and bacteria- they’re infinity self-sufficient, potentially semi-carnivorous entities of enormous size. They are the latest brand of Behemoth, wandering wherever the water is deepest, snapping up anything they gets in their way. Theoretically tameable, I suppose- we could treat them like Water Horses, use them for transport or housing. If anybody dared. If nobody minded the blue tint. I think anything living on that stuff would get it, after a while. Message from the bosses. They want us to start work on a Forest that can survive in salt water, graze across the ocean. I’d love to tell them not to bother; nature always manages, and I have a feeling she’s working on the Forests even as we speak. The weed pollination was just as example of that- making them better, stronger, more resilient. Making them unbound, able to float wherever they want. Making them new. Nature, my Goddess. So much better than any scientist. The Forests are alive, I know that now. A single entity, I used to think of them as two- but that’s just wrong. The Goo binds everything, makes it whole. Some days I wonder if it can think. At first I think it’s a stupid question- but then, surely anything alive can think? Anything that feeds must think of food, and anything with a sense of food must have a sense of being fed... I eat therefore I am. If you relate to the world, you must have a concept of world. If you have a concept of world, you must in turn have one of yourself as separate. Or is that just rambling and nonsense? Maybe that’s not how the Forests work. Maybe they’re more like trees and bushes and bugs- alive, but too different for us to fully understand. There are more of them, every day. In Lakes, reserves, fish tanks. They’re quite the vogue thing. People don’t mind about the psychedelic colours, the mouth-like traps, not even the tentacles (vines, if you want to get technical). They just want to see what all the fuss is about. I wonder if the fuss sees them. Blue Forests. The Leviathans of Generation Next. Good job, team. Now, let’s all look up at the sky. Surely there must be something we can do with that? Data Report: Aerial Observation Team Blue Forest #012 Lake Victoria. Sixth day of watch. Yep. It’s definitely sitting by the edge of the lake, as close to the salt water as possible - where the currents are strongest. I don’t know why. It’s just sitting there. Maybe it likes the view.